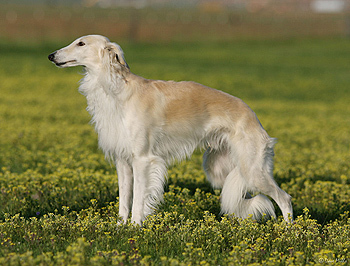 The Silken Windhound is a small, hardy, strikingly elegant sighthound. Its classic, sweeping lines and athletic build are the hallmark of a true coursing dog, which is evident beneath the, luxurious, silky, yet protective coat. Its size, structure, and coat enable the Silken Windhound not only to be a capable runner over a wide variety of terrain and through unpredictable weather conditions but also to be competitive in a variety of dog sports. Viewing the Silken Windhound from the side, one should have the impression of remarkable beauty integrated with exceptional running ability. Beginning with its chiseled head, a long arched neck, dramatic depth of brisket and an extreme tuck-up ending with the graceful sweep of the long, low carried tail, the Silken Windhound is the embodiment of athletic beauty. The moderately long silky coat complements the sweeping curves. 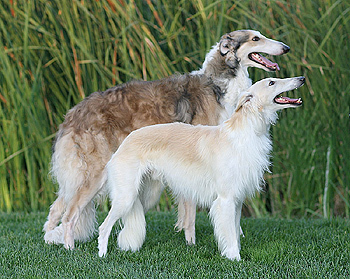 Brewer at 23.5" and Borzoi Indy at 29"
The accepted measurements for Silken Windhounds are 18-23.5 inches (46-60 cm) at the withers. One half inch above and below the extremes is permitted. The Silken Windhound should have a slim, sleek build, through a balanced combination of fine bladed bone and smooth muscle, and should never look frail. Moderately long in head, the Silken Windhound has a fairly narrow back skull which, when viewed from above, tapers gradually through a full muzzle to the nose. When viewed from the side, the top plane of the muzzle forms a continuous line with the plane of the flat skull with a barely perceptible stop between. The muzzle should be strong and in good balance to the skull. Teeth should be large for a dog of this modest size and have full, white dentition. Only a scissors bite is allowed, with the upper incisors fitting closely over the lower incisors. The eyes are rather large, almond-shaped, with a sparkling, lively, inquisitive expression. Ebony-colored eyes with fully pigmented eyelids are highly desirable. Dilute Silken Windhounds, even the blues, have dark eyes. The ears are small, fine in texture and held back tightly against the neck when in repose. When the Silken Windhound is alert, the ears may be prick or semi-prick. They fold back tightly against the side of the neck when in repose. Hanging or droopy hound-like ears are not allowed. The neck is long and slender. It is slightly arched, well muscled, powerful, and free from dewlap, widening gradually and symmetrically into the shoulder. The topline is smooth, with no dips or bulges, and starts at the withers with a scarcely perceptible arch that gradually reaches its apex over the beginning of the loin and then gently falls off over the long croup. A flat back with steep croup is not a loin arch and should be faulted. For speed and drive the Silken Windhound depends upon its back, which jackknifes open and shut. The back must be wide, powerfully muscled, flexible and long. Its deep brisket, firm abdominal muscles, and arch over the loin create the dramatic tuck-up of the Silken Windhound. When running at full extension during maximum effort, the Silken Windhound should execute a double suspension gallop. The shape of the deep brisket is of utmost importance to the function and outline of the Silken Windhound. The brisket is very deep reaching as nearly as possible to the elbow with a graceful upsweep to the extreme tuck-up. The tail is long and flexible falling in a graceful curve with fringe often touching the ground. A tightly curled or gay tail is faulty. The hindquarters are well angulated with a long second thigh and well developed thighs and hocks bent close to the ground. Viewed from the rear, the hindquarters should be slightly wider than the front, well muscled, and without any suggestion of cowhocks. Soft, silky in texture, the hair has sufficient undercoat for warmth and protection, but not so much as to make the coat bulky. The coat may be slightly wavy or even curly provided that feathering along the back of forelegs, from the brisket, breech and tail is long enough to enhance the beauty of the flowing movement. The distinctive hair that frames the ears and face adds to the dog's expression. Hair on muzzle, feet, front of forelegs and hocks should be short. The Silken Windhound moves with a relaxed and level gait, which has great reach in the forward motion and great drive from the hind quarters. Constricted or excessive up and down movement of the legs when viewed from the side are faulty. When viewed from the front or rear, legs must move back and forth with pendulum freeness and without any side or inward motions. Feet seek a center of gravity beneath the animal. Too narrow or too wide movement and crossing, interfering feet are faults. Deviations from this standard shall be faulted, in proportion to their deviation, especially in those areas that govern the functioning of a running hound.